People born from 1 February 2022 to 21 January 2023 are under the auspices of the Water Tiger on the Eastern calendar. The dominant element - water, which greatly mitigates the powerful character of this zodiac sign. The noble animal has a sharp mind, nerves of steel, a strong intuition. However, the Water Tiger quite emotional, sensitive to the problems of the people around them. The color of the year - black, symbolizing the desire for knowledge. Insightful Tiger have the ability to find a common language with any interlocutor. Predatory animal well-versed in the environment, finding a way out of the most difficult situation. These qualities allow him to find a compromise. Water element is significantly softens frantic pressure and excessive impulsive character. Tiger is able to surprise others. People of this sign will never go unnoticed, they are admired and even a little fear. A strong and powerful animal is often dominates and dictates the rules of conduct. At the same time there is a fairly soft, as well feel the mood and state of the loved ones. 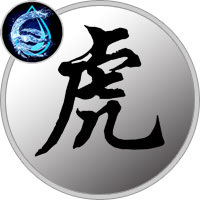 Water Tiger is endowed with strong intuition, it is able to adapt to the new conditions. He will not rigidly insist on his own, but will find another way to accomplish the goal. The truth is sometimes too keen and as a result loses all. Sharp mind allows to control his behavior, however, it is very sensitive to the reaction of the surrounding people. Representatives of this sign are finding themselves in the field of communication, they are able to infect their ideas. They make good journalists, managers, heads of various levels. Brave beast always spoiling for a fight, he will not sit on the sidelines. Tiger is able to take the reins into their own hands in the difficult moments of life. Too emotional and sometimes indecision is not a significant problem. After all, his strong will power over everything, even some weaknesses. Water Tiger will be able to adequately defend not only their own interests, but also easy to solve the problem of people who need his help. At the same time methods of influence will be far from sharp power, the representatives of this sign are excellent speakers. The power of words, vision and flexibility of mind can achieve excellent results. Tiger in love sees no barriers and obstacles in achieving the desired goal. He will achieve favorable attitude of the person who caused it quivering feelings. During courtship sincerely admires the object of passion. It is better to keep it a little at a distance, in this case, the excitement of the hunt even more Tiger inflame feelings. Over time, the passions will subside, it is possible that the active nature of a born leader get bored. It is possible affair and connection on the side. With all the confidence he needs constant admiration, even a certain worship. However, the second half is necessary sometimes to show courage and to keep on Tiger reckless behavior, risky cases.